Russia says the Ukrainian protesters are fascists and Nazis. Are they? 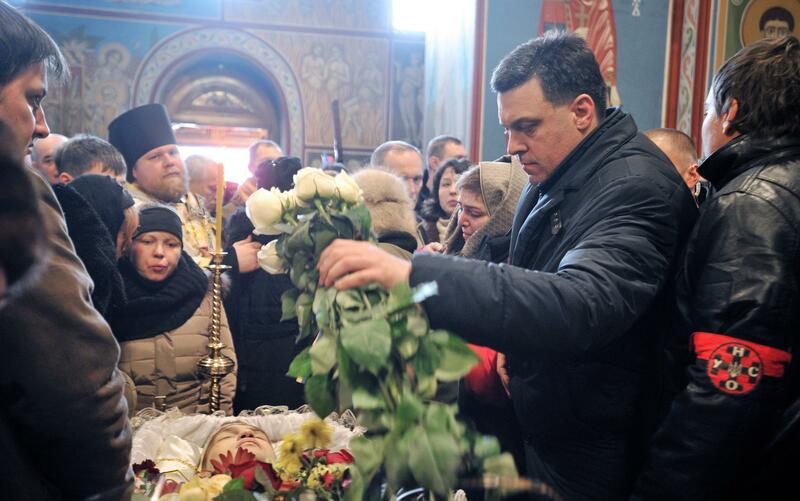 Svoboda head Oleh Tyagnybok pays his final respects to activist Mikhail Zhiznevsky during a funeral service in Kiev on Jan. 26, 2014. If the increasingly bloody turmoil in Ukraine is primarily viewed in the West as a struggle between pro-European supporters of democracy and an increasingly authoritarian government under the influence of Moscow, the official Russian line on the events presents an alternate reality: Western governments are naïve dupes supporting violent extremists with far-right fascist tendencies. The Russian government has a habit of throwing around labels like this a bit casually, but in this case—while undoubtedly self-serving—it’s not completely inaccurate. One of the three figures who form the Maidan movement’s unlikely leadership coalition, along with boxer Vitali Klitschko and former Foreign Minister Arseniy Yatsenyuk, is Oleh Tyahnybok, the leader of the nationalist Svoboda party who has a habit of doing things like referring to the country’s government as a “Jewish-Russian mafia.” The party traces its roots to a Nazi-allied partisan army during World War II and was known as the Social-National Party—in reference to National Socialism—until 2004. Last month the party held a torch-lit march in honor of Stepan Bandera—a controversial figure viewed by some as a Nazi collaborator. It’s clear that the protests against the government by supporters of European integration started before Svoboda showed up and that the party’s presence does not represent all—or even most—of the protesters in Kiev, which include a fair number of Jews. But Tyahnybok’s role has certainly made things awkward for the movement’s international supporters. The protests in the Maidan, we are told again and again by Russian propaganda and by the Kremlin’s friends in Ukraine, mean the return of National Socialism to Europe. The Russian foreign minister, in Munich, lectured the Germans about their support of people who salute Hitler. The Russian media continually make the claim that the Ukrainians who protest are Nazis. Naturally, it is important to be attentive to the far right in Ukrainian politics and history. It is still a serious presence today, although less important than the far right in France, Austria, or the Netherlands. Yet it is the Ukrainian regime rather than its opponents that resorts to anti-Semitism, instructing its riot police that the opposition is led by Jews. In other words, the Ukrainian government is telling itself that its opponents are Jews and us that its opponents are Nazis. The strange thing about the claim from Moscow is the political ideology of those who make it. [Vladimir Putin’s proposed] Eurasian Union is the enemy of the European Union, not just in strategy but in ideology. The European Union is based on a historical lesson: that the wars of the twentieth century were based on false and dangerous ideas, National Socialism and Stalinism, which must be rejected and indeed overcome in a system guaranteeing free markets, free movement of people, and the welfare state. Eurasianism, by contrast, is presented by its advocates as the opposite of liberal democracy. Some have also accused Yanukovych of deliberately facilitating Svoboda’s rise to prominence in western Ukraine as a useful political foil. If true, that now appears to have been a massive miscalculation on the president’s part. Svoboda’s prominence within the opposition movement is certainly concerning, not only because of the possibility it could now play a more prominent role in the future politics, but because it has allowed an increasingly authoritarian leader and his blatantly authoritarian international backers to make the case that their opponents are the ones who pose a threat to democracy. *Correction, Feb. 20, 2014: This post originally misspelled Victoria Nuland’s first name.